In Europe there are about 278.8 million cars and trucks travelling every day and, considering only routine maintenance, about 332.2 millions of tires need to be replaced every year. Most of the tire servicing operations require dismounting the wheel from the vehicle, taking it to a tire changer machine, for extracting/inserting the tire, and consequently to a wheel balancer machine, for balancing the wheel and then re-mounting the processed wheel on the vehicle. Nowadays the operator needs to manually handle and transport the wheels from the car lift to the machines and back. These manual operations are time consuming and tiring and detrimental for the operator and, consequently, the efficiency of the tire processing task is low and the quality of the working condition of the operator can be definitively improved. 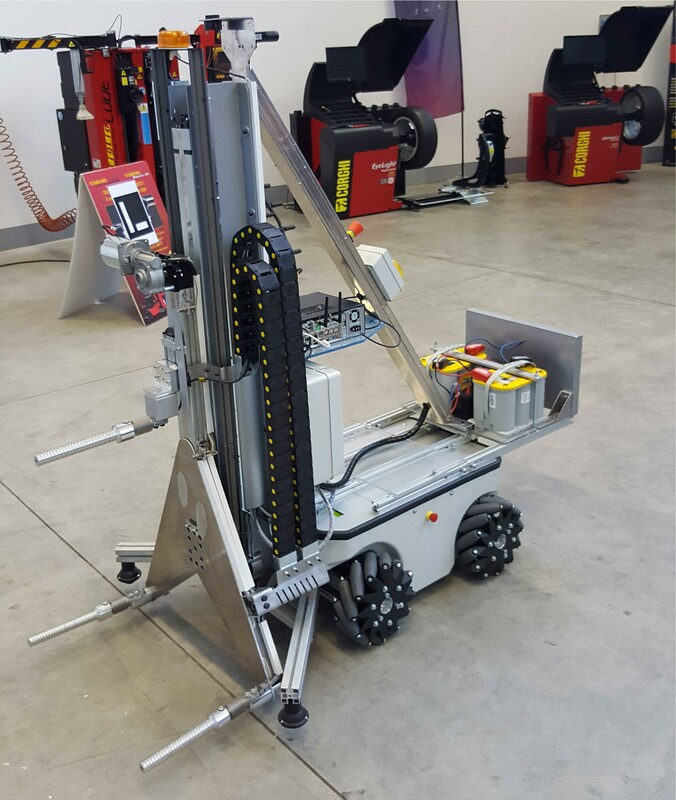 In the TIREBOT experiment, the ARSControl lab of the University of Modena and Reggio Emilia, and Corghi S.p.A., a leading company in the production of equipment for wheel servicing, aim at introducing robotics in tire workshops for improving the tire processing. The goal of this experiment is to develop TIREBOT, a mobile robotic assistant that takes care of transporting wheels among car lifts, tire changers and wheel balancers, and that helps the operator to handle the wheels. In this way, both the time wasted for the manual transportation and the fatigue due to heavy wheels handling will decrease and, consequently, both the efficiency of the work and the quality of the working conditions will increase.